In March I had the exciting opportunity to attend the 2019 AQHA Convention in Fort Worth, TX with both SmartPak’s Marketing Director of Business Development, Lissa Hines, and SmartPak’s CEO, Fraser Cameron. We attended some very interesting talks, met with corporate partners, attended some fun events, and took trips to two Team SmartPak facilities. 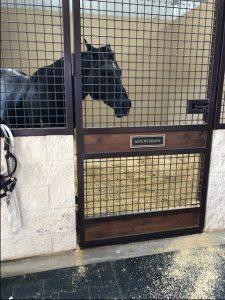 The first facility we visited and toured was Highpoint Performance Horses, owned and operated by Team SmartPak Riders, Charlie Cole & Jason Martin. Slick By Design has lifetime earnings of over $560,000 and holds the record as the fastest stallion who has ever ran at the NFR. Highpoint is one of the most impressive facilities I’ve visited, not only did they have an extensive breeding operation, full of world class equine athletes, but they also had many exotic animals! Lissa and I were aware of the animals we would get to see at Highpoint, but Fraser certainly never expected to meet Gerald or Harriet. 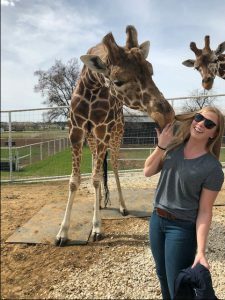 Gerald and Harriet are the two resident giraffes at the facility, and we were thrilled to have the opportunity to meet them up close! 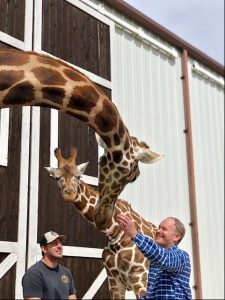 SmartPak’s CEO, Fraser Cameron, meets Highpoint’s giraffes, Gerald and Harriet. Following our Highpoint visit, Lissa, Fraser, and I packed up and headed over to Tom McCutcheon Reining Horses. Here we were able to see state of the art rehab equipment, and some of the top reining horses in the world. When visiting their rehab room, we all took a turn on the TheraPlate, and envied the horses who benefit from this relaxing apparatus after their workouts. 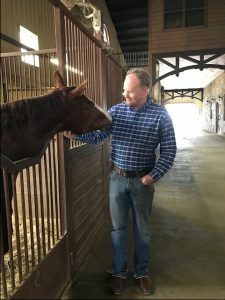 As we walked down the large aisles at the McCutcheons’ farm, I was so happy to be meeting all of the horses behind the SmartPaks we manage, including Gunners Special Nite, The Wizster, and Yellow Jersey. Some of my favorite parts were getting to see Fraser interact with these elite horses (Bailey was disappointed in us for not bringing his favorite SmartCookies) and collecting valuable feedback about SmartPak from the McCutcheon staff. Fraser with Gunners Special Nite (Bailey), who won both team and individual gold at the 2010 World Equestrian Games with Tom McCutcheon. 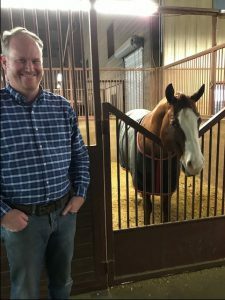 Our trip to Texas was certainly a success: we learned a lot about both the AQHA and the day-to-day on goings of top facilities in the industry! I certainly hope to return to Texas with SmartPak again, especially to reconnect with Gerald, though I could do without him eating my hair next time! That’s me with Gerald and Harriet!